The Planting Of God – I Am Not Ashamed Of The Gospel Of Christ! The earth is the Lords and the fulness thereof. God plants his people right where they need to be, even though some uproot and move to a different location they flourish and grow if the living word dwells within them. Many times Paul preached in one area and then moved on to another as he was moved to do so. Many of us have done the same if we are sensitive to God’s Holy Spirit and can discern it’s prompting. “And after the uproar was ceased, Paul called unto him the disciples, and embraced them, and departed for to go into Macedonia. And when he had gone over those parts, and had given them much exhortation, he came into Greece, And there abode three months. And when the Jews laid wait for him, as he was about to sail into Syria, he purposed to return through Macedonia”. (Act 20:1-3). Israel is Gods inheritance and David was taken from the sheepcote and was told he would be a ruler in Israel and later Christ would come from the lineage of David to build the house of God and establish his kingdom! Israel is a people planted by God within the earth. “Now therefore so shalt thou say unto my servant David, Thus saith the Lord of hosts, I took thee from the sheepcote, from following the sheep, to be ruler over my people, over Israel: And I was with thee whitersoever thou wentest, and have cut off all thine enemies out of thy sight, and have made thee a great name, like unto the name of the great men that are in the earth. Moreover I will appoint a place for my people Israel, and will plant them, that they may dwell in a place of their own, and move no more, neither shall the children of wickedness afflict them any more, as beforetime. And as since the time that I commanded judges to be over my people Israel, and have caused thee to rest from all thine enemies. Also the Lord telleth thee that he will make thee an house. And when thy days be fulfilled, and thy shall sleep with thy fathers, I will set up thy seed after thee, which shall proceed out of thy bowels, and I will establish his kingdom”. (2 Samuel 7:8-12). We are all sinners and fall short of the glory of God, and the beauty of Christianity is one can never be too far from God he does not reach to save us if we repent and humble ourselves before him. We can then be grafted back into the olive tree that we thought we may have lost part in. “Thou wilt say then, The branches were broken off, that I might be grafted in. Well; because of unbelief they were broken off, and thou standeth by faith. Be not highminded, but fear: For if God spared not the natural branches, take heed lest he also spare not thee. Behold therefore the goodness and severity of God: on them which fell, severity, but toward thee, goodness, if thou continue in his goodness: otherwise thou also shalt be cut off”. (Romans 11:19-22). God planted a tree in the Garden of Eden which fed man physically , and also the tree of life which for the soul of man would feed his soul for life or death depending on the choice of the tree of knowledge of good and evil. “And the Lord God planted a garden eastward in Eden; and there he put the man whom he had formed. And out of the ground made the Lord God to grow every tree that is pleasant to the sight, and good for food; the tree of life also in the midst of the garden, and the tree of knowledge of good and evil”. (Genesis 2:8-9). 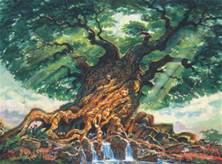 For in heaven the tree of life will be for the healing of the nations and this is the best and most beautiful planting of all God has done! “In the midst of the street of it, and on either side of the river, was there the tree of life, which bare twelve manner of fruits, and yielded her fruit every month: and the leaves of the tree were for the healing of the nations”. (Revelation 22:2).